U.N. Secretary-General Ban Ki-moon says violence "totally unacceptable"
White House condemns attacks and "loss of innocent life"
Spokeswoman for Obama: "We stand with the people of India"
(CNN) -- The following is reaction by world leaders to the attacks in Mumbai, India. 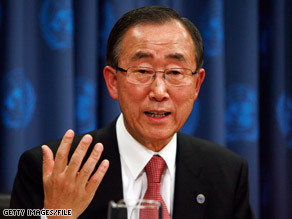 Through a spokesman, U.N. Secretary-General Ban Ki-moon said there is no justification for violence. "The secretary-general condemns the rash of shootings and blasts in Mumbai today, which killed and wounded a large number of people. Such violence is totally unacceptable. The secretary-general reiterates his conviction that no cause or grievance can justify indiscriminate attacks against civilians. He calls for the perpetrators to be brought to justice swiftly. "The president was informed at Camp David, and will be kept updated." "President-elect Obama strongly condemns today's terrorist attacks in Mumbai, and his thoughts and prayers are with the victims, their families and the people of India. These coordinated attacks on innocent civilians demonstrate the grave and urgent threat of terrorism. "The United States must continue to strengthen our partnerships with India and nations around the world to root out and destroy terrorist networks. We stand with the people of India, whose democracy will prove far more resilient than the hateful ideology that led to these attacks." "We strongly condemn the terrorist attacks that have taken place in Mumbai, India. Our sympathies go out to the families and friends of those killed and injured, and to the people of Mumbai. "We are monitoring the situation very closely and stand ready to support the Indian authorities as they deal with this horrific series of attacks. At this point, we are unaware of any American casualties." "These outrageous attacks in Mumbai will be met with a vigorous response. I have sent a message to Prime Minister [Manmohan] Singh that the U.K. stands solidly with his government as they respond, and to offer all necessary help. Urgent action is under way to offer every possible protection to British citizens in the region." "Today's attacks in Mumbai which have claimed many innocent victims remind us, yet again, of the threat we face from violent extremists. I condemn these attacks unreservedly. "Our thoughts are with the families and friends of those killed and injured. The U.K. and India will continue their joint efforts to counter the actions of terrorists."